MOAR MUSIC to be made! 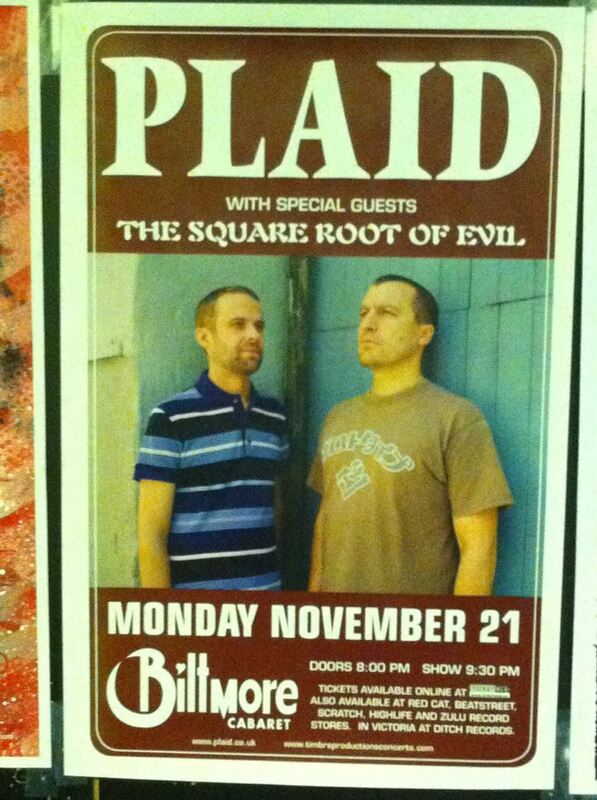 I am opening for Plaid on Nov 21!!!!!! HI AM SO EXCITED! And nervous, but more excited. I have 1 new song but will try to make another one in time. Now onto practicing! and practicing! and practicing! and practicing! and practicing! and practicing! and practicing! and practicing! and practicing! HOLYCRAP. i played a show on sat at the zoo zhop. AND IT WAS AWESOME. great crowd, and great people to play with!!!! March 1, 2011 - Utopia!!! i am playing this saturday…saturday…saturday as part of the Utopia festival at W2 in Vancouver. 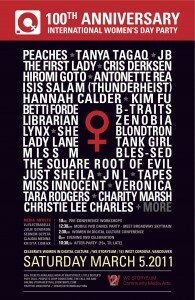 this is gonna be an absolutely amazing day, so many superrad people are playing, and they all happen to be women! 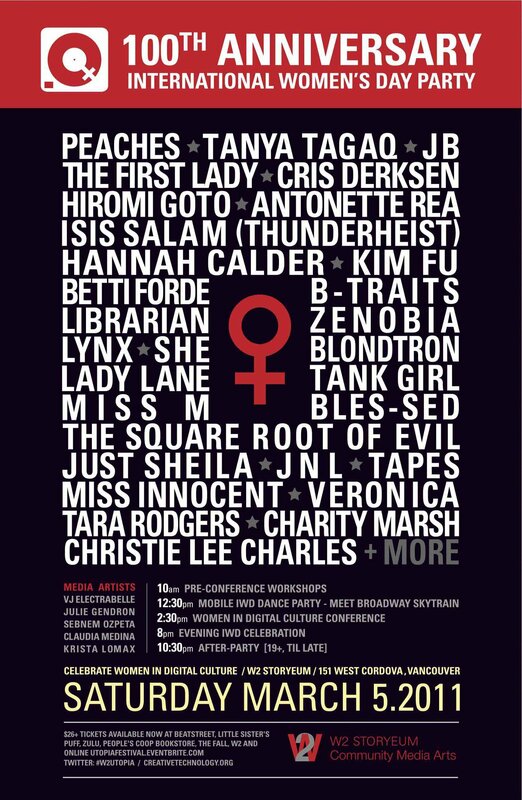 i am pretty stoked for Isis Salam and Tanya Tagaq, Peaches is gonna slay and i can’t wait to hear Blontron’s set! Blondtron and i will also be doing an Ableton workshop at 5:15, so come on by and watch me be hella nervous. making people dance is easy, talking to a bunch of strangers is intimidating, but i am one who rises to challenges. it’s pretty much an all day affair, although most of the shows will be after 10. go to their site for tickets. stoked stoked stoked!!!!!!!!! i’m gonna bring the oooontz (and the bleeps- also, some squelch) so please put on your dancing shoes. mine are silver and glittery, btw. show in vancouver last night was SO GOOD, i had a ton of fun and loved all the cheering out there. many thanks to dylan for putting the show on, and everyone else who played was AWESOME. now no shows lined up, so I WILL MAKE NEW STUFF. so…… played a hardware set again last night as part of “anything cute”, and it was awesome. we are so going to do that more often. drums machines, polysynths and xox boxes, oh my! i have a show on dec 11 that is going to be SUPER. breakcore crazy!!!!!! both shows made my heart explode. june 18′s show was amazing, the crowd was super cool, full of lots of friends and a few new faces. due to time constraints, i didn’t get to play my whole set as the square root, but i did have a lot of fun playing the hardware set with something pretty, and hope to do that again sometime soon. my truncated laptop set was full of all the crazy fast ones though, so that was fun. the show on the 3rd, at sequential circus, was also incredible. i was a bit nervous about being on last, cause crowds tend to disperse before then, but i was pleasantly surprised by the amount of people around, and totally stoked when they were all dancing like crazy! lots even kept up when i ramped up to my 180bpm songs! tons of people came up and chatted to me during and after my set, i seriously really appreciate when people tell me they like it, cause it’s hard to tell when bright lights are in your face sometimes. there will be an audio recording surfacing sometime soon, and some video too! the other acts were really awesome, noodly melodies from wesley dysart, crazy bangers from jonnay, and a very fantastic set from dark arps. i unfortunately missed the others, but heard very good things. thanks so so so much to the peeps who put on the show, it’s so great to have support in this city. so…….i’m playing mutek on june 4th!!! that’s fubar. i’m really excited to play in la belle province. i’m even cracking out the controllers!!!! it will be super fun, playing with old skool internet friends citifono. please come by if you can, it’s freeeeeeeee!!! and july 3rd in vancouver, i’ll be at open studios for the 7th installment of sequential circus. i promise to make you, yes you, dance. if not, i’ll buy you a beer.